VOW MLS Listings Search. 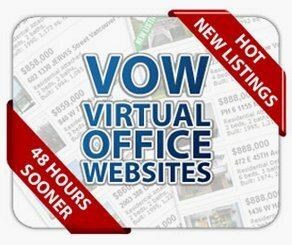 Your own FREE Virtual Office Website (VOW). -Your personalized VOW MLS Listings Search will be updated in real time. In other words, if there are any new listings or price changes you will be the first to know… via e-mail. -Organize your favourite listings, print them or e-mail them to your friends. If you are interested to view a few properties, contact us to schedule the appointments at your most convenient time and day. Then you can benefit from our experience and strong negotiating skills to get you the lowest possible price at the best terms and conditions. As a buyer, all benefits, services and $$$Savings are FREE for you. We get our commission from the seller. There is no cost or obligation to use this VOW MLS® Listings Search VIP exclusive service, but the Real Estate Board of Greater Vancouver requires you to sign up for this level of access. You may discontinue this service at any time, and you are under NO obligation. Fill the submission form on this page. In the Notes field type “vow” and get access to dozens of listings every day before everyone else sees them. Enjoy this obligation free VOW MLS Listings Search. Thank you in advance for sharing this page with friends and colleagues on your favorite social media networks using the “share” buttons below.